After the War broke out, there was the well-documented attitude that “It’ll be all over by Christmas'” Initially life went on pretty well as before until the casualties started to pile up, and Christmas came and went. Some clubs, such as Clydesdale Harriers, suspended activities ‘for the duration’ but in practical terms, the athletic season continued pretty well as before with the same sports meetings on the same dates in summer 1915. George Dallas missed some of the early season meetings but was in action by the end of June. The following appeared in the Glasgow Herald of June 26th, 1915. George Dallas competed at the meeting in the relatively tame 100 yards, off a mark of 4 1/2 yards, and finished third, inches behind the winner. He had won both heat and semi-final en route to the final. The Military Marathon was won by 4th Battalion Scottish Rifles, B Company, in 1 hour 58.6 – a creditable time for what was basically a half marathon in full military kit in company with eleven others. 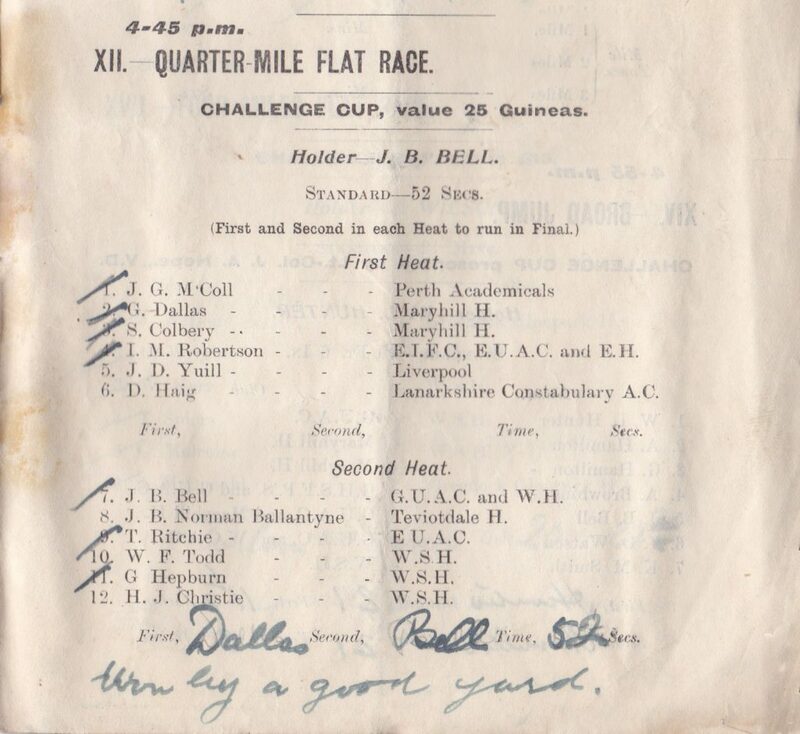 On 3rd July, at Hamilton Academicals Sports, again in the 100 yards Dallas was second in first heat, but unplaced in the final, off 4 yards, then in the half mile first in first heat (listed in the programme as G Dallas, Maryhill and West of Scotland Harriers), from a mark of 14 yards, he was unable to beat the handicapper and was unplaced. At Ayr United F & AC Sports on July 17th, he ran first in the 220 yards, where he qualified for the final as fastest loser from 6 heats, and was second in the Final. He also turned out in the half mile where he was first as G Dallas, Maryhill H, running from 14 yards he won by inches in 2:02.4. In to August and as usual the Rangers Sports were the first big event. Held on the seventh of the month he won the half mile off 12 yards in 1:58.6. The Celtic Sports were the following week but he was not mentioned in the results – the first three were from marks of 46, 41 and 60 yards respectively so the handicapper might have been the problem there. On 14th August at Celtic Sports, he was not among the results but the first three in the half mile were off 46, 41 and 60 yards respectively. By 1916 reality had set in and what sports there still were, had programmes that were scanty when compared with previous years, eg The Rangers Sports had only five running events and a five a side tournament. The open events were 100 yards, 220 yards and Mile, and there were two military handicap races over 100 and 220 yards. Top runner was WR Applegarth who won the military 220 yards. Otherwise they were purely domestic races which nevertheless attracted a crowd of 15,000 spectators. Dallas was by now taken up with military duties. It may have been his first summer home when he won the 440 yards, it was not the first SAAA championship after the war. There was a One Mile Relay race held on Saturday, 24th May at the Eglinton Harriers Sports and although the team was not named, it is possible that Dallas was a member of the winning Maryhill team. He was certainly in action on 31st May, one week later, when Edinburgh University AC held their sports. Several Open events were included and Dallas won the half mile off 8 yards in 2:00.4. He also ran the first stage of the Mile relay for Maryhill which won in 3:50.0 with Goodwin, Hamilton and Colberry making up the team. At Hampden a week later the same relay team won the Mile relay in 3:47.5 by 20 yards from Edinburgh University AC. Another week, another relay: this time it was at the West of Scotland Sports at Ibrox on 14th June and the same Maryhill Harriers squad won from Greenock Glenpark Harriers in 3:51.4. Then at Tynecastle on 23rd June he again competed in the double of open handicap half mile and relay. In the former he was third, running this time from scratch and in the relay Maryhill was beaten for the first time that year – their team had one change from the usual and that was Dobbie in for Goodwin – and by Edinburgh University AC. On 28th June 1919, the SAAA Championships at Celtic Park included a One Mile Medley Relay and with five wins from six relays, Maryhill Harriers had to turn out a team. Reverting to the Dallas/Goodwin/Hamilton/Colberry quartet they defeated Greenock Glenpark in 3:53 in what was described as one of the most interesting relay races ever seen in the district. Dallas also ran in the championship half mile where he was second to Hector Phillips of Greenock Glenpark who won in 2:05. The next Saturday he was out in the Kilmarnock FC meeting where he won the half mile in 2:00.2. Partick Thistle held their Sports at Firhill on 12th July and Maryhill again won the Mile medley relay with a team of Dallas, Hamilton Cook and Colberry and Dallas was second by half a yard in the half-mile handicap. There was no half mile at the Ayr United FC Sports on 19th July but there was a Mile Relay which Maryhill ‘won easily’. Unplaced in the half mile at the Glenpark Harriers Sports on 26th July he was again a member of a winning relay team when the four of Dallas, Goodwin, Hamilton and Colberry beat Glenpark Harriers by a yard in the fast time of 3:44.2. That was probably their hardest fought win of the summer – record so far – 10 relays, 8 firsts, two seconds! The next relay was at Celtic Park for the Celtic FC Sports where, having been given 45 yards start on London’s Polytechnic Harriers, they finished second having turned out their best team. The Londoners’ time was 3:32.8 which was cut above the best that any Scots team had done. It should be noted that the Polytechnic Harriers team were almost professional athletes during the summer months touring all over the English regions and Scotland as well – they had even been on the Continent and at one point at least the AAA had asked about how they were financing their activities. They were undoubtedly a good squad and it was no reflection on Maryhill that they had lost to them. Their record that summer must be one of the best ever run by a club team. The Queen’s Park Sports were held on the first Saturday in June and Dallas was in action twice that afternoon. Not in the 880 yards did he run but he turned out in the invitation 440 yards handicap which he won from the mark of 5 yards from Edinburgh’s Robertson (8 yards) and his team mate Colberry (6 yards. He won by 5 yards in 50.8 seconds. He then joined Colberry, Bell and Cook in the club relay team which won in 3:48.8, 15 yards in front of Edinburgh Northern Harriers. Three relays, three victories – but that was about to change. West of Scotland put the Wyoming Cup (won outright before the War at Hawick) up for a relay at their Sports at Ibrox on 12th June. And West duly won their own trophy with the Maryhill team of Bell, Colberry, Cook and Dallas second, beaten by a single yard. This was nevertheless a good performance with the West leading off with Scotland’s top middle distance runner, D McPhee, on the half mile leg. Report said that the contest for the Wyoming Cup now stood at one each for Maryhill and the West with the Cup going to the club which won it three times, not necessarily in succession. The SAAA Championships were held as usual on the fourth Saturday in June – the 26th -at Powderhall where Dallas won the 440 yards in 52 secons defeating Maryhill team mate and a man who had featured in many a winning relay team with him, JB Bell. He only won by a yard though. The Maryhill team then won the medley race in 3:47.2 with a squad of Dallas, Goodwin, Bell and Colberry. The second team was the West of Scotland team. Into July and Dallas was back at Kilmarnock FC’s Sports where he won the half-mile. According to the report he showed fine judgement in winning his heat without difficulty and had an easy journey in the final. Running from 8 yards he won in 2:06 with second and third runners off 55 and 32 yards respectively. West of Scotland held a sports meeting at Rothesay on 17th July but Dallas was nearer home at West Kilbride where he won the half mile from 4 yards while second and third ran from 50 yards and 55 yards. He was said to have ‘won easily’ in 2:03. Race entries at this point were very big in all races, particularly the sprints – eg in the Celtic Sports in 1920 there were 22 heats of the 100 yards. 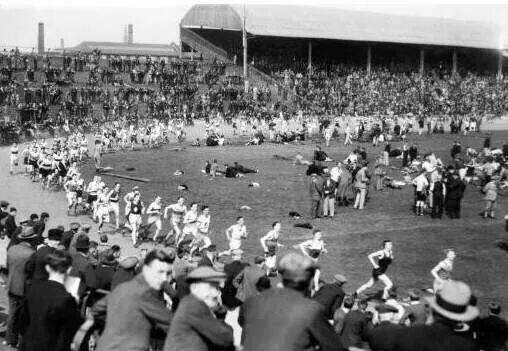 The Herald commented “The season of 1920 will be remembered more by the extraordinary number of competitors than by the high quality of performances recorded week by week.” Look at this picture of a mile handicap at Ibrox – not sure of the date but fields of this size and even bigger were not uncommon. The result was that the back markers had a big job to get through the field which often meant max effort in the heat and again in the final. Even the 100 became a test of strength with heat, second round and then the final. So when Dallas and other half milers had to run a heat from four or five yards where they gave the limit man up to 60 yards, then a final as well, it was not easy. Often made harder by having big numbers on the track to wend their way through as well. “The National Cross-Country Union of Scotland held their first amateur sports meeting at Celtic Park, Glasgow on Saturday afternoon, when a varied and interesting programme was submitted. Entries in all events were large but the public attendance was somewhat disappointing.” [Glasgow Herald 23rd May, 1921] Dallas ran in the medley relay with Bell, Goodwin and Colberry and they won easily in 3:48.4. On 4th June the Queen’s Park Sports were held and Dallas was part of a Glasgow Relay team consisting of Duncan McPhee, JB Bell, Dallas and HJ Christie which defeated an Edinburgh team of EH Liddell, L Robertson, T Ritchie and WJ Ross. JB Bell (who later went on to represent Glasgow University as well as the club) won the SAAA 220 yards and 440 yards in 1919, was second in the 440 behind Dallas and third in the 220 in 1920, was again third in the 220 and second in the 440 in 1921. AH Goodwin won the SAAA 100 yards in 1919 and was a finalist in almost all sprints at all major domestic meetings. S Colbery was most unfortunate in not gaining any championship titles. He was a member of relay teams from the start of 1919 to the end of 1921. G Hamilton who ran with Dallas for Maryhill an West of Scotland pre-war was another fine runner whose only Scottish medal was a third in the 1919 100 yards championship. But no matter how good they were, they were all relay specialists of the highest order and the teams of which they were members were the best in the country at the time. At the West of Scotland Sports at Ibrox on 11th June, the host club defeated Maryhill in the relay by a yard in 3:49.6. Whether Dallas ran in the open half mile or not we don’t know – the first three were from marks of 58, 45 and 45 yards and the paper was ambivalent about the value of the big numbers of entries for most events but especially the 100, the half mile and the mile. However, the most interesting race on the programme was the relay with Duncan McPhee and George Dallas facing each other in the half mile opening stage, “McPhee ran a great race, finishing a yard ahead and securing the Wyoming Cup for the promoting club.” If the reigning SAAA champion ran a great race to finish a yard ahead, surely Dallas must also have run a great race to hold him to a single yard? The SAAA Championships were held on 25th June at Celtic Park before 5000 spectators and with more competitors than at any previous championship. Dallas ran in the quarter mile which he had won the previous year but without that success. He won his heat in 53.8 seconds. but in the final the bets he could do was third behind GT Stevenson of Shettleston Harriers and JB Bell, his Maryhill club mate who was also third in the 330 yards. The Maryhill team was out in the relay looking for the third successive victory and the team looked good enough to win – Dallas, Bell, Colberry and Black – but the Edinburgh University team of Eric Liddell, JM Davie, GI Stewart and EW Cormack proved to have the better of them The winning time was a very good 3:43. On 2nd July Dallas preferred the Glasgow Police Sports at Ibrox to the Hearts FC meeting at Tynecastle and ran in the quarter again. Running from 4 yards he was a’good third’ with the gap between first and second only ‘a foot’. ‘A Dallas’ ran in the half mile where he was fourth from the generous allowance of 57 yards. A week later, 9th July, Maryhill Harriers held a sports at Hawthorn Park, Springburn when ‘A Dallas’ was second to A Boyd of Bellahouston Harriers who won in 2:00.8, a yard in front. Again the mark was 57 yards. Was A Dallas a relative? Or a misprint? I would think the former since the name was very well known in Scottish athletics, since 57 yards seems a big start for one who had been third in the SAAA quarter-mile and since the programme had managed to get G Dallas right for the quarter at Ibrox. On 23rd June there were several sports meetings being held but the Eglinton Harriers meeting at Saltcoats saw the next generation of Maryhill Harriers talent on display when WH Calderwood was second in the half mile. None of the great relay teams of 1919, 1920 or indeed 1921 were on parade that day. On 30th July George Dallas ran in the invitation 300 yards race at the Greenock Glenpark meeting at Cappielow in almost continual rain. He finished second to GT Stevenson (Shettleston 2 yards) who won in 33.4. Stevenson had been one of the ‘finds’ of the season, a surprise winner of the SAAA title he won the international at Belfast beating both Englishmen and both Irish runners. The new generation was coming through. 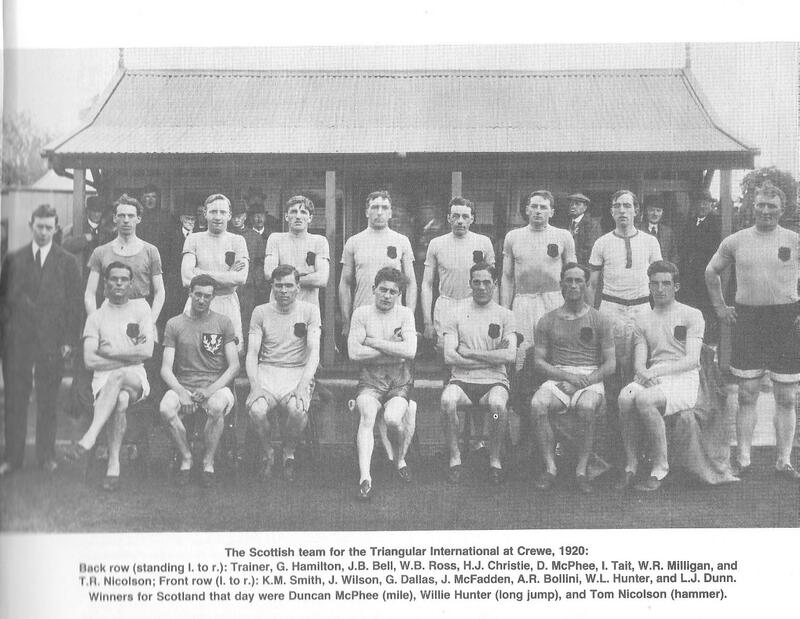 At the Rangers Sports, the only member of any of the relay teams in which Dallas had appeared, to figure in the results was S Colbery (12 yards) who was second in the invitation 300 yards ahead of Eric Liddell (4 yards). Colberry was a very good runner who had been unfortunate not to win a national title and here with 8 yards start from Liddell over 300 he held him off, being beaten by HJ Christie (West of Scotland 10) only on the tape. Dallas had been racing since 1908 and had been unfortunate that the War hindered his progress as an athlete. He had been involved in athletics administration for several years and in 1921 he was elected Honorary Secretary/Treasurer of the National Cross-Country Union of Scotland, a post he was to hold until 1946 and in 1922 he was elected Secretary of the West District of the SAAA. He was on two national governing bodies simultaneously, holding responsible positions on them both, and something had to give. He may have continued to run in 1922 but he was nowhere to be seen at his old stamping grounds – not Queen’s Park, Hamilton, Rangers or Celtic Sports, nor was the relay team in evidence. However he was not finished with athletics by a long chalk – he was a capable administrator and official for more than four decades: in 1962 he received an MBE for services to athletics.